Alice Bell is a sort of typical teen that has an overprotective father. The difference is that her Dad is paranoid that the monsters will get them if they go out after dark. So one night Alice begs her parents to go on a family outing and watch her little sister's performance. They consent since it is Alice's birthday, but just barely. Unfortunately for Alice, this is when everything comes crashing down. Her father's monsters that she thought were figments of his imagination turn out to be real. She is left the only survivor and sent to live with her grandparents. Alice switches schools and luckily runs into a girl she knows and is instantly accepted into her group of friends. Which is great since she's dealing with the loss of her family, she finally has a bit of something normal to cling to besides her grandparents. But when Alice and her new BFF run into her friend's ex and several of his other friends everything stops for a minute. Alice can't help but go starry eyed at the group's leader. Tall, dark, and handsome with a dash of dangerous and you have Cole. Cole is the leader of a small group of high schoolers that fights zombies. The world is built quite nicely, not everyone can see zombies, only a certain few. They are drawn to one another, so Cole's group is tightknit and not exactly welcoming when Alice comes around. The zombies are a bit different than normal, they're sort of on the spiritual plain, so the teens have to fight them in that plain as well. It's all quite interesting and unique. I'll admit, I was first drawn to the book because of the name and the cover, I'm a huge Alice in Wonderland fan, so I knew I had to read it. The actual content blew my expectations out of the water. I'm so glad my boyfriend's sister got me this for Christmas, I had to force myself to put it down so I could sleep. I highly suggest this book if you're a fan of Alice in Wonderland, or zombie fan. Oh I've read this one at its release and I really enjoyed it too but I confess that I haven't read more, I really should! I hope you'll like the others as well. I'be looked at this book, but as I normally avoid YA, I haven't tried it yet. I keep seeing good reviews, so maybe one day I'll pick up. 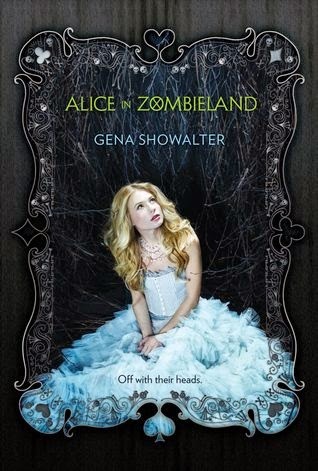 I normally avoid YA as well, I had to read this one though since it's Alice in Wonderland. Hope you enjoy it if you pick it up! Oh gosh you just gave me an idea! I think I will read my zombie books this week in honor of TWD return this Sunday!! Thanks Mel! Muah! Oooh I love that idea!! I haven't found many zombie books to be my taste, this one was probably the best one to date that I've read though. Hope you enjoy! hahaha I know how it is. I really enjoyed this one too! Also the following book. I haven't gotten to the last book and you just reminded me I need to that. I'm not a huge zombie fan either, wonder if it's just how they're written in this genre. I've been dying to read this one ever since it came out! I LOVE all things Alice in Wonderland, and am a total The Walking Dead addict, so fairy tales & zombies are a match made in heaven for me. This WILL be my first Gena Showalter book. Soon-ish... I hope.